Vision isn’t enough. Aspirations don’t pay the bills. Dreams that require public money never take flight if you can’t mobilize the votes to fund them. That in a nutshell is where we are today and why we have been stuck in Low Earth Orbit for the better part of two generations. And yet, the future is always up for grabs. Public will, to borrow a phrase, is a force that can be awakened. But if we want to change the course of what our government will fund and support, the place to start is with a pragmatic assessment of where we are today. The simple truth is that today’s community of private sector, public sector, academic, and individual space enthusiasts represents a relatively narrow segment of the general population and it is even smaller in the bigger scheme of political interest groups, lobbying power, and ability to win votes on legislation. It is a very small constituency in terms of the ability to motivate and mobilize voters to engage their government representatives. It has largely been unsuccessful in capturing the public’s imagination. Despite the legacy of Apollo which effectively puts America’s space program on par with Mom and Apple Pie, less than one in ten Americans is ‘aware and committed’ when it comes to following the space program. The very term ‘space enthusiast’ is even a bit geeky in the old-fashioned derogatory sense, not the newly chic Silicon Valley version associated with a pathway to riches and fame (SpaceX excepted). Tell people you advocate a big move onto the space frontier (or are writing a book on the subject) and they are likely to look at you rather sadly as if you never quite grew up and are probably still a Trekkie and have a Lightsaber in your closet. (Just to be clear, neither is true on the author’s account). This is not just a humorous point. It’s a strategic one. We are starting from a point in terms of general public perception where Apollo is an historical event with little resonance beyond collective pride in our past and the public’s perception of space is shaped more by fictional movies like Star Trek and Star Wars. In pragmatic terms, if you compare the most prominent space advocacy organizations with their peers on the environmental side you begin to see the scope of the problem. What should be clear is that the environmental organizations are large, well-funded, and have significant staff and resources. They have mass support and can drive the public agenda, albeit not without significant opposition as discussed earlier. By contrast, the space advocacy organizations are mostly small, have limited funding, and lack significant resources or leverage. They are on the fringe and fighting for the future with water pistols not howitzers. When it comes to space advocacy, we are not starting from a position of strength. Money, members, and staff are directly proportional to influence, impact, and votes. Space advocacy is not a power player. If you want to change what is possible in public policy, then you need more than a small group of enthusiasts, you need to engage a very large percentage of American voters and convince them that the program you are promoting will create something for them that they will value and that it is worth the sacrifices and the trade-offs in an age of austerity. Not only that, but you need to maintain that commitment in large enough numbers to drive a paradigm shift in public policy and funding and to sustain it over a time span of decades. Change of this nature rarely occurs or lasts because of a new book (or essay), testimony to Congress, a stirring speech calling to our better natures, a Commission report promoting inspiring moments, or a President launching a new initiative. These are transitory events that still require, and continually fall short of, the votes necessary to fund them, no matter how laudable. Something different is needed. Real change is more likely to come as the result of a multi-decade, sustained effort by many individuals and organizations generally marching in the same direction to bend the course of the future. Think of the environmental movement or the rise of modern conservatism over the last several decades and you’ll have a sense of the scope, scale, and duration of the effort and commitment required. Getting from here to there will require converting an insular industry and a relatively small demographic of geeky oddballs (no offense intended) into a mass movement. To achieve such ends, you don’t need policy recommendations – you need an action plan. Policy recommendations are what you do when you have the votes. An action plan is how to get the votes. A valid action plan will need to be based on three components and three metrics designed to measure progress in building mass interest in a vastly bolder future in space. Increase the percentage of Americans ‘Aware and committed’ to the space frontier from 9% to 75%. Increase the percentage of Americans that believe we are ‘Not spending enough on space’ from 22% to 75%. Increase the percentage of Americans willing to support a 10x increase in NASA’s budget from ‘unknown’ to 75%. We’ll explore each of these program components and how to achieve the metrics above. Then we’ll talk about how to pay for a big program in space. Let’s start with building a baseline. Who cares about space? Why should they care? What will it cost? What do we get out of it? Those questions are at the crux of the current dilemma. Right now, we can’t really answer any of them convincingly. We have no systemic roadmap or comprehensive economic rationale in place to rally around or engage the public with. Nor do we really have a clue what the public is interested in or willing to support. My guess on all of this is not much better than yours. We’ll explore each in turn. I have suggested that the American public is willing to support a more aggressive program in space. But this is an untested hypothesis. It needs to be tested rigorously. The foundation of an integrated program to transform what the public believes is possible starts by conducting public polling to establish a baseline understanding of where the public is today, what it might consider under various assumptions, and what the constraints are for engaging the public in making the space frontier a priority. We will need to design and implement a polling program that can be carried out over multiple years in which the results are shared publicly and transparently. Of course, you might feel some skepticism at this point. I’ve thrown out a bunch of assumptions about what Americans are willing to fund, but I have no real data to back it up and, truthfully, my opinion is no better than yours. It’s a fair point. So, I decided to put my hypothesis to the test. I went out Survey Monkey and purchased a random, political sample survey of 210 people. I asked six core questions and nine background questions meant to gauge basic demographics and likely voter participation. I have listed the six core space-related questions in Table 1. For each of the six questions I have shown the percentage of respondents that selected either ‘Strongly Agree’ or ‘Somewhat Agree’ for both ‘All Responses’ (n=210) as well as a subset of respondents that were identified as ‘Likely Voters’ (using a modified Perry-Gallup Likely Voter measure) (n=150). If you want to explore the details of how this survey was done and the responses received, Appendix A provides the detail along with a discussion of the survey methodology. Appendix B has the top-line questions and the survey responses by the numbers. Men are more likely to support a larger effort in space than women, but there is a significant portion of women that are also supportive. The baseline of support among women is in the 30-40% range when it is a ‘hard’ question with actual spending numbers. On the softer questions of support in principle, women support the space frontier with number >65%. So what do these findings mean? Conventional polling has shown that Americans are broadly supportive of NASA and space exploration, but only 22% say they believe we don’t spend enough on space exploration. That quandary has been discussed and built into the assumptions and conclusions of multiple commissions and their reports across many years about what kind of space program is possible for America. Yet, what the results above suggest is the possibility that we have been asking the wrong questions and drawing the wrong conclusions. Compared to urgent and morally compelling needs on Earth, space exploration is always a cost and it has failed and will continue to fail the test of public support for increased funding. By contrast when offered a far more ambitious set of proposals to spend much larger sums and sustain that spending over many years, BUT tie it directly back to Earthly needs for economic growth and better jobs, baseline support is nearly twice as high. And it inches higher still when you consider likely voters, which, truthfully, is the group that every politician is most concerned about. When we explicitly link America’s space program to the creation of a profitable economy in space that offers a direct payback and also creates high-paying jobs, it connects directly with priorities here on Earth. We are in the midst of a low-growth, winner-take-all economy in which high-paying jobs are increasingly hard to find except for a small number of the highly skilled or well connected. A frontier that offers a chance for high economic growth and high paying jobs for Americans at all socioeconomic levels both in space and here on Earth is a fundamentally different proposition than funding a program of space exploration that involves an elite few leaving footprints in the dust of other worlds. There are some caveats. As surveys go, this is not a perfect sample or professionally crafted survey. These results do not prove my point. They are just a start. What we need to do is engage professionals to create a true baseline survey and follow it up with focus groups and research. We need to understand what these results really mean and how firm or soft they really are. At best, this survey offers a hint, a glimmer of a possibility, that Americans might just be game for betting big on a much bolder future than we have given them credit for. 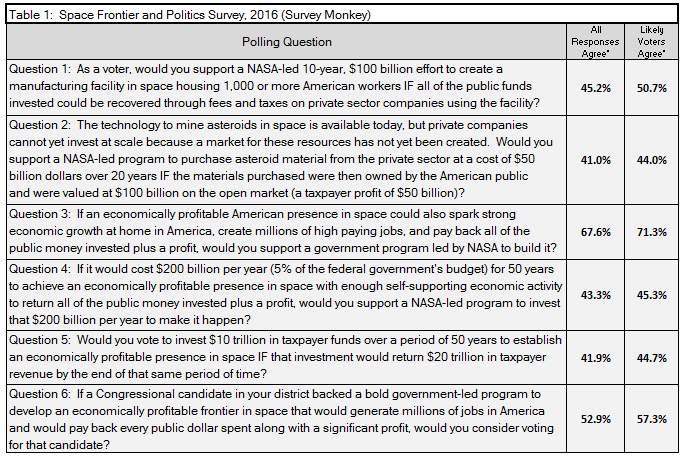 The first step in building a baseline sense of what Americans support is a bigger, more concerted effort at polling and public opinion research to build on this tentative first step and find out what Americans are really willing to consider when it comes to building out the space frontier and achieving scale in space. We are going to need a Technology Roadmap. As noted earlier, a strategy to achieve Frontier Dominance will require a roadmap that articulates the specific technologies and applications that will allow for the dramatic cost reduction (on the order of 99%) needed against today’s baseline cost structure in order to achieve Frontier Dominance in the near earth space environment along with a timeline and a plan for fielding them. It must articulate the cost, the value proposition, and the business case that each specific investment or technology will have on reducing the overall cost of achieving Frontier Dominance. Today, NASA has a set of Technology Roadmaps that are focused on the technologies needed for space exploration. That means safely sending a small number of people on long journeys and protecting them from the hazards of space. These are roadmaps to support astronaut numbers in the single digits. This is the right roadmap for the budget today and reasonable assumptions about the budget tomorrow. But I’m not interested in reasonable. I’m after extraordinary. These roadmaps miss the opportunity to envision a bolder program at much bigger scale. We need to articulate a bigger dream. We need a ‘shadow’ roadmap to a much larger presence in space. What we need is the visionary Technology Roadmap that begins to articulate how we are going to support 100,000 people and more in Near Earth Space, how we are going to transport 25,000 people a year beyond LEO at a price point that is less than one percent of what it costs today, and how to build very large structures in space with a rapidly falling cost curve. And those are starting point numbers for mid-century. That alternative Technology Roadmap must detail out how we will bring the cost of traveling to and living in near earth space down by 99.9% or more, how we are going to supply resources and grow food in space instead of lifting it from Earth, and what technologies we will need to create in order to build large structures in space. To create such a roadmap, we should incent a variety of actors in academia, the policy community, and the private sector to develop a set of technical roadmaps and pathways to achieving scale in space. This directly corresponds to the program I sketched out in the previous chapter. An incentive could come in the form of a competition (we seem to love competitions these days) or could come in the form of small grants or commissions to various teams to make their own roadmaps to show how the space frontier might evolve, the technologies needed, what the specific steps would be, etc. Should the funding be earmarked, it could also come in the form of a series of study groups or commissions jointly funded by NASA and the private sector. The Technology Roadmap should become a continually updated baseline that reflects new innovations and discoveries and becomes the project plan for the future. The most important component of building a baseline will be an Economic Roadmap. An effort will be needed to engage economists and policy makers to model out the economic assumptions in the earlier chapter and analyze how a massive investment in the space frontier to achieve Frontier Dominance can lead to scenarios for economic growth that would pay back the initial investment and significantly boost the American economy over time. An economic roadmap would attempt to better understand how the flow of funding will cascade throughout the American economy. It would consider the larger set of outcomes in terms of sustaining and building industries, creating high paying jobs at home, and fostering new technology and advanced manufacturing leadership to drive a more prosperous American economy. Assumptions for this modeling should focus on what a future presence at scale on the high frontier would look like economically and the implications for the tax base and federal revenue through to the end of the century as compared to current projections. It is critical that these studies map out a pathway and the requirements for achieving significant payback over time. We are playing the game for the right side of the graph – the one in the previous section that shows a dramatic lift-off for a space-based economy and what it means for rapidly increasing tax revenue. Imagine a federally funded program that breaks even or achieves a profit. If it can be achieved, it would create a breakthrough opportunity for a vastly expanded effort in space. Now dream bigger. Imagine this was also the key to sustaining not just our federal budget, but for achieving a more globally equitable economy worldwide as well. If the pay-off from the space frontier is really exponential growth, it may represent a massive funding surplus that can be deployed for all of humanity. An economic study would attempt to analyze and map this out with more specifics. There are massive ideological battles playing out over the future of America’s fiscal and economic future and the economic roadmap should show the scope and breadth of how a presence in space at scale would both use and return funds to the public coffers and to what extent it addresses or compounds the challenges we face more broadly in the coming decades. Modelling out these economic assumptions and impacts is a crucial step and has implications both for engaging the public and the political community. If we cannot create an economic model that shows a positive net impact on the American taxpayer, then it will be very hard to achieve scale in space. With these first three baseline steps, what we will have done is prepare the baseline foundation around which to build engagement with the American public, policy community, and political elite in the form of white papers, studies, and points of view which can be synthesized into political messages, marketing data, and demographic segments. Before we initiate the second set of activities, we must be sure that the first group has delivered actionable and feasible results. If the polling, technology roadmap, and economic forecasts do not provide a solid foundation for believing that a massive break-out onto the space frontier makes technical and economic sense or that the public will support it, then we can stop right there. But I don’t think it will. I think these activities will give us the messages, detailed roadmaps, and resonant themes that the public is hungry for. Now it’s time to use them. It’s time to bend the culture. Bending the culture means teaching people to dream big about a bigger, bolder future in space that is tangible and within reach. It means mainstreaming enthusiasm about the space frontier and a bold American venture in space. So how do you reach a large number of people in a way that changes their expectations and hopes for the future they and their children will have? Some would argue for a social media campaign or an online outreach program. They might point to testimony by such luminaries as Neil Tyson or a recent film by Erik Wernquist called Wanderers, which shared a powerful vision of a future in which humans have spread throughout the solar system. Examples like these have inspired many thousands and achieved significant online attention. But neither created any sustainable movement or traction in actual funding for space activities and this highlights the scope of the challenge in connecting with the public. These individual events lack traction because they are isolated notes in the louder cacophony of noise as the broader culture flows ever onwards and individuals and firms jostle for people’s attention, the headlines flare over the latest crisis or curiosity of the day, and yesterday’s news, video, and vision fades into the past under the onslaught of ever more input today. A few bright notes or personalities may get attention and rack up views or achieve a following, but few have a truly lasting impact. Numbers in the thousands or millions sounds impressive, but they are fleeting, ephemeral moments at best. The film Wanderers has had a few million hits. Gangnam Style by South Korean pop star, Psy, has had over 2.5 billion. Neither has changed the world. Fame and attention are remarkably transient in the digital world. A better metaphor for what we need to achieve is the marketing campaign for Star Wars. You saw it everywhere. Whether you liked the film or planned to sit it out, it was inescapable. The messaging came from every direction and you came across it in every media. There were toys and product placements. Press and media galore. If you have children, you could not escape seeing, hearing, and probably purchasing a Star Wars themed toy. And even if you didn’t, your children’s friends probably did. And if reports are to be believed, that marketing campaign was fairly restrained by big budget Hollywood standards given it was playing to a strong fan base and significant pent up demand. Of course, we are not talking about an iconic film with an established brand and a massive marketing budget tied to specific near-term revenue generation event (film release) with a strong profit incentive. But neither do we need the same velocity or expense. What we do need is a campaign that is financially self-sustaining, able to reach tens of millions, and can convey a vision of the future over a time span of decades. We need to engage people across a variety of formats and forums, through media and in person. And we will need to attract a large number of entrepreneurs, organizations, and partners to participate. We need to build events around the country focused on space that have the same reach and impact as state fairs. People love fairs, but would they go to a space-themed fair or expo? Consider the Smithsonian. What this suggests is a strong interest in space. Given a choice, people vote with their feet and are most interested in Air and Space. This data point offers a hint of how popular the space frontier might be to the general public if we develop it. But here’s where the data point falls short of where we need to go: Ninety percent or more of what the Air & Space Museum portrays and exhibits is about our past glories and accomplishments, not about our future possibilities and dreams. Hence the word museum. What we need is a large format show that reaches the public in a physical way and that flips the ratio of past vs. future. We need a show that is 95% about the future. It may start small, but ultimately we need an expo in each of our top 25 metropolitan regions that people can visit and enjoy once a year that shares a positive vision of what a big future in space looks like, that meets their aspirational desires for a more prosperous, bolder America, and provides a format for advocacy organizations to connect at scale and volume with the American public. It should include all of the traditional features of a fair such as obscenely high-calorie fried foods, adrenalin-fueled carnival rides, and concerts by B-list musicians that still have a following. These events should be fun for the majority of Americans and we should pander to the masses aggressively. Now, there are established events that allow you to reach millions of people. They come in a variety of forms. From conferences (think Comic-con) to science museum exhibits to large public events like those state fairs and even air shows. If you want to begin reaching people immediately or test the waters, you simply need to become an exhibitor and rent space. The price varies with the brand and nature of the event. The upside is instant access to an audience as long as you have the money. The downside is that you will be one exhibitor among many and your message will be diluted as a result. You will fight for attention in a crowded space and the number of people you truly connect with will be smaller than the total number of participants. Instead, I would argue for engaging the public directly in a series of specific branded events designed to increase public awareness and engagement with a vision of the space frontier. There are multiple formats possible. I might start with a variation on a traveling exhibit that runs sequentially in multiple locations in the US and seeks to hit the top 20-25 top metropolitan regions every 12-18 months. Think of a Comic-con for adults, an event for a market that wants more than make believe. If I created such an event, I would start small with a set of pilots and build from there. But the long-term vision would always be to grow into a big format expo, or fair, that lasts weeks rather than days. The goal is to engage 50-75 million Americans each year with a vision of what our future could look like. We should aim to build a dream that will inspire millions, fundamentally change expectations about the future, and drive a behavioral change in voting. Designing a one-off show is probably easy. Creating a brand that is financially sustainable and can continually draw the right content (exhibitors) and engage the public effectively over a run of decades would be a significant challenge, but the potential pay-off would be very large. It would allow you to engage and build a list of those millions of American voters and consumers who share a common dream and interest in America’s future in space. I would supplement the show/fair type events with an annual or bi-annual live broadcast show. For the live broadcast event, I would attempt to include some of the most significant luminaries in the technology/space field to promote a vision of scale in space. When I think of luminaries, I don’t think of astronauts, former aerospace executives or NASA alumni – although we would want to include them as well. Rather, the headliners I think of are people with names like Musk, Bezos, Page, and Brin. These tech entrepreneurs are themselves people who believe that it is possible to have a big future in space and they have each made investments in everything from rockets to asteroid mining. Much larger government outlays and program expenditures in these areas are very much in their self-interest. In short, this is a cause they might support and there is a compelling reason for them to do so. The American public, in turn, is fascinated with entrepreneurial success stories, especially in the technology space. Each of these extraordinarily successful people are objects of fascination and the American public will mostly listen to what they say as representing smart commercial sense. In other words, they have more name recognition and public credibility then any politician, government agency head, or even Hollywood movie star. These are the voices I would attempt to deploy in an integrated way to engage the American public. Of course their time is valuable, so an optimal use of scarce time is to focus their time on a live TV event, which I think of as being on par with the Oscars but focused on our future in space in which some of our most admired technology titans share with the American public why they think a big future in space is possible and in everyone’s interest. Think of it as the ‘3 Tenors’ of the space frontier. I don’t use the analogy lightly. It may be these people are competitive, temperamental prima donnas and it may be hard to get them to work together. Conversely, they might also enjoy the chance to share the stage and connect with the public. And like that original show featuring three extraordinary opera personalities, a live event just might create a bit of magic as well. If we can produce a public broadcast event to share a vision of the space frontier, then there is the potential to convert many tens of millions of people to supporting a vision of a more aggressive move onto the high frontier. Pair this up with a series of shows or expos traveling around the country with enough scale and frequency to engage a significant share of mind and the combination has the potential to change public awareness of what is possible and to do so at scale and speed. I’m not a big fan of consumer culture, but – like it or not – the things you buy, the toys you give your kids, the books you read to them, and the games you play with them weave a subtle fabric and context that can have a lasting impact for the rest of their lives. The 5-year old you read a story to will be a voter in 13 years. The 10-year old you inspire will be a college activist or entrepreneur in ten more. The 18-year old that finds a dream today will be a political activist in ten and perhaps a Congressional candidate twenty years out. What we buy for our kids is a starting point that can have a lasting long-term impact. When I go to a Space Museum or Science Museum, I invariably pay close attention to what their store sells. I have yet to find an impressive line-up of products. When I surf Amazon, I see a lot of stuff with a space theme, but not the kind of products that I would like to see and would like to buy for my children when it comes to the space frontier. An action plan to bend the culture, therefore, also has a section on encouraging and inspiring companies to create and market products that cater to a potentially large market. Proving that market exists will be easier if you are able to create the shows and fairs and live broadcast events or prove that they are coming. What company will say no, if you bring a plan to send a few million consumers their way? A 10-pack of little Gold Books on life in a space settlement for children ages 2-6. A board game on par with Ticket to Ride or Power Grid, but set in near-earth space and focused on building production platforms, harvesting asteroids, and producing fuel, water, and food in space. For the 10+ age group. A video game set in near-earth space with a compelling mystery or problem(s) to solve, but that provides an accurate view of potential living conditions. I’m not a fan of the shooter games, so what I would purchase is something different if it were for my kids. An iPhone app on par with the vibrancy of Zen Garden that offers a tour of a future space settlement. A version of Minecraft set in outer space that allows people to design and build space colonies, lunar bases, and Mars settlements. Books that show with art and illustrations how to build space settlements, production platforms, and harvest asteroids – think of books from David Macaulay – and that illustrate various aspects of life in near earth space, Moon colonies, or cities on Mars. Models with cut-away views of a near earth settlement, NASA and SpaceX rockets, or a moon base, Mars colony, etc. Some of this already exists from established brands, but most focuses on the past (Apollo, Space Shuttle) and not the future. The full range of smaller products that fill in the gaps at various price points from pins and posters to T-shirts and art all of it illustrating what the future in near earth space could look like in 50 years. That’s just a partial list of what we need to commercialize. Where it exists today, we need to find ways to help market it to the general public as part of a broad, coherent campaign with consistent messaging and a long-term impact. We need Amazon, eBay, and YouTube channels dedicated to the merchandising and productizing of this vision. Where it doesn’t exist, we need to encourage its creation. As a medium, film is unparalleled as a channel to reach people at scale and connect with their imagination in a way that no political add or public speech or motivational media campaign can rival. It’s also risky. Not every film is a success. Not every motion picture connects with the public or is memorable or finds an audience. Most lose money. With all the talent in Hollywood constantly using their considerable experience to create products that Americans will buy, the truth is that they get it wrong more often than right. Sometimes stunningly so. Despite these risks, the upside of film is enormous. If we want to bend the culture, then we need to enlist Hollywood in the cause. We need to consider how to influence the creation of a new genre of films set in near earth space fifty plus years in our future. When I think about a film in the context of America’s space program, I’m not targeting either Star Wars or the fare you get at the science museum IMAX, but something with elements of both. We need to capture people’s imagination with a depiction of the near future in a way that draws a direct line to how they vote today. Think Erik Wernquist’s Wanderers on steroids, feature length, and with an actual story. Our action plan for promoting a big future in space and bending the culture, should have room in it for encouraging and seeking to fund the creation of movies, both in IMAX and in traditional format. Such films would be set 50+ years in our future in a period where we have achieved break-out in space. They would portray a future where we have tens of thousands of humans in space settlements using technologies and engineering that are not beyond reach and imagination. The rationale for such movies is to be able to show a visual, practical view of what the frontier could look like fifty years from now. If Hollywood can make film after film about characters, situations, and dramas in the more mundane reality of our everyday lives here on Earth, then we are almost certainly capable of coming up with compelling story-lines set against the backdrop of humanity in space 50 years hence. There are smart people in Hollywood and elsewhere that can help develop such projects and create storylines and scripts. All I know is that you wouldn’t want me to do it. With my sense of irony and humor, I would pitch a whodunit with Earth based detectives sent to solve a murder in a space settlement where the culprit turns out to be a malevolent and bitter AI created by a failed experiment to upload Ray Kurzweil’s brain to the internet. This kind of thing amuses me, but I’m geeky that way. Instead you would want professionals to craft these stories. They should stick to the formula of offering a brave group of men and women living on the frontier, facing incredible odds, and rising historically to the challenge of building a frontier in space. There are multiple benefits to creating a movie or movies. In his article, Zacks was commenting on the issue of films that misrepresent historical events. However, the same concepts apply, and in a more positive light, if we want to portray the potential of a positive future in space and if, indeed, we want to shape public opinion at scale and speed. Film is uniquely powerful. It trumps political stump speeches, commercial advertising, and social media. It has the potential to transform what the public believes is possible in a decisive way. Both of these data points speak to the power of movies and the role of the popular culture in shaping opinion and the potential for redefining what the public thinks is possible. The Martian, a recent film about a Mars exploration mission gone awry, was a significant hit in the fall of 2015. If we were to measure the impact on public support for a future Mars exploration mission, it likely moved the needle in terms of what people think is possible. In the case of our proposed films set 50 years in the future, the goal would be to convince people that this is a destiny that we can create and to show in a tangible way what it looks like. Thus a film, if crafted right and with core funding in place and distribution and marketing produced jointly with an established industry player such as a Disney, Time Warner, or Lionsgate, then a feature length motion picture can potentially be one of the most powerful tools for reaching the broader public that is available and shaping their view of what is possible. Second, the production of a film creates a set of assets in the form of sets, visuals, models, characters, etc. and these are outputs that can be harvested and used to reinforce other activities and engagement with the public. These IP assets include both the sets and the models as well as software, illustrations, and images all of which can be leveraged and licensed into follow-on products from video games to toys. Films allow us to engage some extraordinarily talented people in creating a setting for the future and we can then use those assets to pitch to the public far above and beyond the first run of the movie itself. In effect, films allow us to circulate content back into the parts of the action plan we have just discussed such as fairs and shows and merchandising. It allows us to take advantage of the Hollywood marketing machine to turbo charge a broader effort to bend the culture. Third, a well done film has a chance to pay for itself. What I am envisioning is not intended to be a blockbuster, but to be entertaining and interesting. It will focus on a global audience. If it achieves pay-back, then it has created enormous leverage for the broader goal. Payback is not to be considered lightly or optimistically. Many films lose money and even films that make money and gain recognition fail to return money to initial investors. Hollywood is very good at spending large sums, doing creative accounting, and maximizing its own returns at the expense of investors. However, there are also examples where savvy producers are able to achieve a return on investment and if the funding for the film can be recouped in part or in whole, then the film represents a powerful baseline tool for engaging the public both during its distribution run and afterwards. On those grounds a significant investment in one or more full length feature films is both relatively high risk and also a responsible investment with potential to create a significant reward in the cause of building public support. If a film has the potential for commercial return on investment, the initial funding can both be seen as an investment and as a source of leverage to attract additional funding. Our action plan should target inspiring the creation of content for future movies through financial support, hosting contests, etc. We should seek to raise seed funds for a select number of films. If such a program were done in synergy with efforts to launch and run large format fairs/shows and a live broadcast event, we have the potential to offer Hollywood access to a large market of interested consumers. At the end of the day the set of activities outlined in this section – an expo/fair, a live broadcast event, a merchandising strategy, and a film initiative – are about engaging and bending the public and political culture in a certain direction. Each is mutually reinforcing and each as outlined here is just a starting point. Will we help to finance and support a single movie directly or build a program to influence the broader pop culture through incentives and contests and prizes ranging from soliciting and supporting the most interesting scripts, books, and multi-media products? The truth is the effort may be broader than a single film, but discussing the virtues of a film is a good example to start with. And how does a fair/expo fit in? A fair is a vehicle that can begin to collect ‘customer’ names for future products whether books or movies. It can also be a forum for identifying and signing up donors and volunteers for future political campaigns. If we produce a movie concurrent with running an expo/show that hits the top 20 or 25 metro areas around the U.S., then it is also possible to believe we have a vehicle for signing up moviegoers and promoting a fan base for such films. A merchandising strategy allows us to reach people of all ages with products that portray a future that is possible. It begins to weave a narrative for an American Dream in space at scale. Finally, that live event is a chance to tie it all together and drive it to a higher level, especially if it occurs annually or bi-annually. The sets of activities outlined are a starting point in a dialogue to define an integrated set of initiatives that can be used to shape the popular culture. They are and can be mutually reinforcing and – in synergy – potentially very powerful. Ultimately, however, the point of bending the popular culture, of instilling a vision of what is possible, is to be able to rally the votes and shape the political process to turn dream into reality. How to do that is the subject of the next section. If we want to truly open a new frontier in space and if that venture will require massive public funding, then we need to figure out how to shift public opinion at scale and speed. We then need to use the inputs from our efforts to ‘build a baseline’ and ‘bend the culture’ to transform public will, what the public demands from their political representatives, and, most importantly, how they vote. We will need to establish a political action plan, a campaign to raise funds, engage an army of volunteers, and secure millions of votes. We will need a fully staffed contingent of lobbyists to cultivate politicians and the policymakers that support them with ideas. We will need to make our presence and impact felt on the ground and become a part of every politician’s electoral math to winning higher office – and impose a penalty if they do not. All of this is doable. It is hard and will take time, but it can be done. To make it real, we will need to work on the basic ecosystem, take a few risks, and win some elections. If you look at what both Environmentalism and Conservatism have achieved over the last generation, you begin to realize we are at the starting point of a similar effort that may take a generation to realize and will require a massive effort by multiple organizations that are generally aligned and allied, but also competitively positioning for attention. These other movements have strong ecosystems driving political support and mass mobilization and I see no other realistic path forward to achieve something similar without a comparable effort. These are the basic building blocks to creating a larger scale movement. We’ll take them in turn. Space Advocacy Organizations. We saw earlier that the current organizations supporting space advocacy, no matter how laudable and pioneering, are tiny on the political playing field. We need to grow them by several magnitudes of order. We will need a larger ecosystem of larger organizations to have a true impact on space. Organizations like the Planetary Society and the National Space Society need to go from a few tens of thousands of members to ones with a few million members. They will need enough revenue to employ a large staff focused on driving the political agenda. These entities – or ones like them – need to employ lobbyists to work the political machine. Of course, there is plenty of room for more and new organizations to represent the future in space and it is unclear now if the same names will lead the way or be supplanted by others that are more innovative and effective. The market will decide in this respect. Think Tanks. I have outlined a series of requirements for ideas and detailed analysis in this essay and this type of work is the purview of professional research organizations, or Think Tanks, in the Washington parlance. It is possible that existing organizations from the Brookings Institute to the American Enterprise Institute to Third Way may contribute to this cause. But these Think Tanks have a broader agenda and it may be that we need to create and endow new organizations whose sole focus will be on the space frontier and driving the policymaking and analysis necessary to be successful. Think Tanks also have an important role as both a landing spot and training ground for a new generation of policymakers and politicians. With that role in mind, it is probably important to have at least a few independent, dedicated organizations. Donors. All of this will take money and so the role of the political donor is critical. It is clear that the current generation of space advocacy organizations have largely failed to attract large donors or achieve mass interest. Yet this is a fundamental building block necessary to drive change. It takes money. I think a compelling value proposition can be crafted to attract donors in large numbers. We are talking about bending the direction of the future and unleashing double-digits economic growth for a sustained run of 100 year or more. We are talking about opening up a new frontier and creating a vibrant society that is free and democratic and represents the best of humanity. Donors love this kind of thing and the wealthy can do the math on the implications for everything they hold and own from stocks to property. We need to make a focused pitch with a resonant message and begin building up a large donor base to support both political action, advocacy organizations, and supporting research. If the value proposition for the space frontier is truly viable (and that is yet to be proven), then I suspect donors will be very interested and can be attracted in large numbers. Lobbyists. You need lobbyists to drive legislative change. Lobbying has become a dirty word in our political lexicon, but is inherent to the political process and we will need to have a cadre of our own. These people follow the money, so if you have donors and organizations with large budgets, then obtaining them should not be particularly difficult. Candidates. We are going to need to identify, train, and support a cadre of politicians who are strong supporters of an enlarged space program, by which I mean 10x larger than today. Some of these will be Democrats, some Republicans, and some Independents and non-affiliated. There are likely very few existing politicians willing to stake out a position for massive funding at this point given the competing interests, priorities, and party platforms today. Our job is to find candidates and arm them with a political rationale, campaign material, staff, and professionals, and most important the language of the future so that they can successfully make a case for change to their constituency and win an election. We have to prepare their constituency for such a message and be able to fend off the inevitable counterattack. When Newt Gingrich spoke of moon bases during a Presidential primary campaign some years ago, he was widely mocked. We need to prepare the public better and arm our candidates with better messaging on how to make the case for space. When opponents of the space frontier can be successfully portrayed as obstructionists of a more prosperous future in a way that voters understand and agree with, then we will have achieved success and the candidates will come to us. But this is a long way off. Volunteers/Activists. Politics requires boots on the ground in the form of a committed army of volunteers and activists who believe in what you are doing and why and are willing to donate their precious time in return for a chance to play a part in something bigger and more noble than the everyday routine of daily life. Our job will be to enlarge the number of people who are interested in space from a small fringe to a much larger demographic of people that are excited by the future and willing to devote time and energy to efforts to make it a reality. I don’t think this is going to be hard. I think if you build it, the volunteers will come. Voter Data. Finally, we need to translate all of the above into voters willing to commit to our cause and we are going to need the kind of voter data that existing parties currently have and routinely use to support their candidates. To summarize, building out an ecosystem will take time and effort, but it is absolutely critical to convert ideas and aspirations into actual votes. If we are bending the culture and pointing people to these organizations, then we can begin to build them up and they in turn will begin to have a larger impact. It is not enough to just have a strong ground game, a bigger and better ecosystem. Those fundamentals are important, but every successful team also needs a few big plays up its sleeve. To me a big play means creating a 501(c)4 entity and raising and spending upwards of $10m on a given election cycle to create a turning point in public perception of what is possible. There is no such thing as a ‘safe seat’- just a lack of good alternatives. Americans are hungry for a positive vision of a prosperous future – and have largely been disappointed to date. The Space Frontier offers a prospect of a much more prosperous future. When billions are being spent on election cycles, a target of $10 million must look small, mere table-stakes in the grand scheme of things, but I would argue it can be deployed strategically and can achieve an outsized influence, far more than such small numbers suggest. So here is what I would propose to do with that money: Defeat precisely two Congressional incumbents. One Republican, One Democrat. Narrowed down to two specific Congressional campaigns in an off Presidential cycle year where donor money is not as abundant and attention is not as focused, the impact of $4-$4.5 million in a single Congressional campaign has the potential to be strategic and decisive. It doesn’t matter to me which two incumbents we attack as long as it is balanced between both parties. Attacking two incumbents and funding a challenger that is willing to go big on America’s future in space allows us to battle test political themes while simultaneously educating the public about what is possible in creative new ways. To me this is a valuable proving ground to find out what is possible. It’s a test of maturity of our ecosystem, one with strategic outcomes. Consider the strategic impact if we win. The odds are long and it is a best case scenario. But if you successfully knock off two incumbents, you have done so because something resonated with the public’s perceptions and desires. This is unusual when it occurs, is fundamentally powerful, and it instantly rewrites the rules for every other candidate. Every other political office holder – at the national level that means the other 533 remaining Congressman and Senators – will suddenly have to take notice. Knocking off two incumbents (preferably ones in ‘safe’ seats) means all the rest have to immediately evaluate, shift, and adapt. Every candidate would need to rebalance the political calculations that they make to get re-elected or defend their supporting coalitions. In practice, this means if you successfully find a winning theme that can cause a politician to lose office, every other politician will immediately try to absorb that theme in order to fend off future rivals. So much the better if it can be a bi-partisan theme. In other words, we only need to win twice to change the game for everyone. Now, politics is a funny business. Incumbents are ‘sticky’ because they are good at what they do and have built a coalition that supports them consistently. Incumbents have also been thoroughly battle-tested for their durability, public persona, and ability to connect. Challengers often think they are smarter or more polished, but few have faced the level of public scrutiny involved or been put under as much pressure where every sentence is parsed for offense, injury, or incompetence. We routinely underestimate the skill it takes to be a credible political candidate. We may love or hate our elected representative (mostly the latter), but we have to respect and acknowledge that they have won elections because they are good at getting elected and the losers are less so. The conventional wisdom routinely underestimates how much skill or talent (and professional advice) it takes to win public office, especially at the national level. While some candidates are capable of trumping these ground rules with rancor and populism, it is unlikely that this will work for very many and unclear if it will be successful in the long run for those that do. But that leads to a more fundamental point. Few also appreciate how volatile the electorate truly is, how fast it can gravitate to a new idea or public persona, and how quickly today’s powerbroker and safe seat can lose an election. Just ask Eric Cantor in 2014. Or the Labor Party of Scotland in 2015. Or consider the rapid rise and remarkable victory of Donald Trump in the latest election cycle. Picking a credible challenger and equipping them with the right supporting messages while staying within the ground rules of political campaign law will not be easy and will require the input of professionals. You need a candidate with the right balance of charisma and substance combined with extraordinary levels of energy and the ability to communicate and connect. It will also require a bit of luck along with a flavor of something new and fresh on the political landscape. I would personally consider it a longshot to win both targeted races, and maybe even one. But it is possible. And the mere act of trying has the potential to change the political landscape in a fundamental way. As the SAS motto says, ‘Who Dares, Wins.’ We should dare. If the campaign is successful, our notional $10M is just a starting point and the 501(c)4 nonprofit we have created immediately becomes a focal point for a longer term, larger effort to engage in the political process and seek to influence elections across the full breadth of the national landscape. Winning will supercharge everything. Winning always changes the game. However, it is those first two elections that are the key and the challenge. I would contend that they are worth the investment. And, frankly, it would be fun to do battle for the future of America in space. The true test of success will be if we can bring the votes and overcome the opposition to fund a large-scale program in space. We will have to build the ecosystem and we will have to fight and win elections. We will have to play hardball in the halls of power against veteran professionals hired to protect every special interest under the sun. But if we can build up an ecosystem and a mass movement and start to gain traction through electoral wins, if we can bring the votes to the polling stations, then we will establish momentum to build on and we will have begun to bend the future of America in space and on Earth. Achieving Frontier Dominance requires an action plan to shape public will to and changing what Americans believe is possible when it comes to achieving scale in space. Changing both public perception and the political landscape will lay the foundation for rewriting the script of America’s future in space and on Earth. What I have pitched here is beyond what one person can do or even one organization within the current community focused on space advocacy. We will need to build out a much more robust ecosystem and engage in a concerted effort that will last decades. We will need to convince a majority of Americans that a sustainable and profitable frontier in space is feasible and keep them engaged for the better part of two generations. The first step is to build a baseline. Establishing a valid baseline is critical. This is the fact-based foundational material of technology roadmap, economic roadmap, and public polling that enables engaging the public in a substantive way to bend the culture and bring the votes. It is the essential starting point. But it is just a starting point. We will then need to Bend the Culture. That means large-scale public events like state fairs that engage tens of millions annually. It means live broadcast events that bring together the most prominent voices in our society and economy to share a vision of a space-based future. It means stoking the commercial culture with products that reinforce the message and the dream. It means enlisting Hollywood to create the visual backdrop of what the future could look like. These are just a few of points on my brainstorming whiteboard. Others may come up with a better plan or set of suggestions. The point is to shape what people believe is possible and expect their politicians to deliver on. We need to bend the culture to the point people see the space frontier as less science fiction and more cultural expectation. Once we have achieved a critical mass in public perception, we must Bring the Votes. We must build up an ecosystem for political action. Then we must engage in the hard fight of defeating at least a few incumbents and supporting the politicians that back our cause. It is what every other interest group or mass movement does and if we want to win, then we must play the same game with greater ferocity and determination than everyone else. We must proactively dive into the muck of politics at its most banal and dirty and deliver results that change how budgets are allocated. And we will then have to sustain that pressure for the better part of two generations. If we do all this, then we will have a shot at seizing a frontier for a greater and more prosperous American and Human future. We will have earned the right as a civilization to expand outwards and to become a species with a destiny greater than one planet alone.